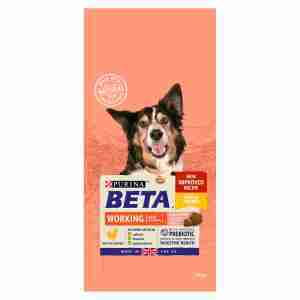 PURINA BETA Adult Working Dog Food is a complete and nutritionally balanced mix tailored for dogs with jobs. Packed with antioxidants and amino acids, this dog food takes care of your active pet’s muscles day in, day out. Its high levels of fats and proteins keep your dog energised, which is especially important during key high-intensity periods of activity, like herding or hunting. Natural prebiotics have been included to keep your dog's digestive process ticking over, while vitamins A and E nourish a thick coat and a robust immune system. Suitable for dogs with sensitive stomachs, this food is free from artificial flavours, colours and preservatives to keep digestive irritation at bay. Breeds like Border collies and English setters have traditionally been bred to hunt and to serve as working dogs on farms. As a result, they can be protective of their territory and wary of strangers, even if they’re friendly family pets. It’s vital that they’re properly trained, groomed and socialised and that they get frequent exercise, so their bodies and minds stay in great shape. This food is tailored to your working dog’s unique needs, keeping them active and healthy with a mix of protein, vitamins and antioxidants. It can replace their standard mix for life. When changing your dog’s diet, pay attention to their reaction. It’s best to introduce this food gradually over a period of seven days to avoid stomach upset. Wheat, chicken meal (22%), oils and fats, dehydrated animal protein, poultry fat, wheat middling, dried beet pulp, dried chicory root (1%), minerals, dried carrot (0.07%), dried spinach (0.07%), dried parsley (0.07%). Protein 27%, fat content 14%, crude ash 7.5%, crude fibres 2.5%. Vitamin A 24 150, vitamin D3 1400, vitamin E 115; mg/kg: Ferrous sulphate monohydrate, Calcium iodate anhydrous, Cupric sulphate pentahydrate, Manganous sulphate monohydrate, Sodium Selenite, antioxidants. Adjust quantities according to your dog's activity level, physical condition and individual needs.